where beta_0 is the baseline transmission rate, epsilon is the relative seasonal forcing, and phi is the day of the year when the transmission rate is maximal. Note that, unlike the SIR model with a constant contact rate, we now have the time derivatives of S and I dependent on a function of time. This is called a non-autonomous system of differential equations. The mathematical analysis of non-autonomous disease models is much nastier than that of autonomous models, and the reproduction number is not straightforward to define. In addition, there is no nice formula for the final size like we were able to derive for the autonomous model. In fact the final size of the epidemic whose spread is described by the above equations is a function of the start time of the epidemic, relative to the day of the year when the transmission rate is maximal (I often refer to this as the time-of-introduction of the virus to the population). We will see in a moment that the time-of-introduction can have a profound impact on the shape of the epidemic curve and final size of the epidemic. Based upon the above equations there are some interesting observations we can make: note that maxima and minima in the the prevalence, I, occur when dI/dt=0. From the above equations, we see that these extrema occur when S/N=gamma/beta(t). Now we know that S is always decreasing (in a model with no births, and where recovery from infection results in immunity). This implies that at each successive extrema in the prevalence, beta(t) must be larger than it was at the previous extrema (and this is true no matter what the time dependence of beta(t) is). So, in the 1918 and 2009 pandemics that had summer waves, the transmission rate at the minimum in prevalence between the summer and autumn waves was greater than it was in the summer. And the transmission rate at the peak of the autumn wave was still greater. This observation gives at least some information about how the transmissibility of flu changes during the course of the year. The following plot should be produced: You can see that the shape of the epidemic curve really depends on the time-of-introduction. The R script also prints out the total fraction of the population that has been infected by the end of the epidemic, and you’ll notice that it too depends on the time-of-introduction. I also show in the script a nice little trick in R to determine where local extrema occur in a time series, and in the script I used it to print out the times when the prevalence is at a minimum or maximum. Shiny is an R package that makes it easy to build interactive web apps straight from R. You can host standalone apps on a webpage or embed them in R Markdown documents. Chowell, G., et al. “Transmission dynamics of the great influenza pandemic of 1918 in Geneva, Switzerland: Assessing the effects of hypothetical interventions.” Journal of theoretical biology 241.2 (2006): 193-204. Edit sir_harmonic.R and examine how the final size and shape of the epidemic curve change when you change the initial number in the population that are infected, I_0. Can you see that increasing I_0 is really pretty much the same as introducing just one infected person at an earlier time? What times-of-introduction (if any) produce a dual wave of infection? Repeat the process with epsilon=0.50. Now change R0 to 1.2, and try different values of epsilon (like 0.1, 0.3, and 0.5), and a wide range of times-of-introduction to see what kind of epidemic curves you get. Notice that for the times-of-introduction that do produce dual waves, those waves appear to occur around a year apart, just like seasonal influenza epidemics (note that several studies have estimated the relative seasonal forcing of influenza to be around 20% to 30%). Try other types of time-dependent periodic transmission rates, and see if you can produce dual epidemic waves. For instance, you can try a Heavyside step function that makes the transmission go down somewhat in the summer, compared to the rest of the year (similar to what we would expect when kids go on holiday and reduce their contact rates with other kids). To help you out, in the file heavyside.R I give a function that implements an approximation to the Heavyside step function that is differentiable (non-differentiable functions in systems of ODE’s make the problem “stiff”, and the software for numerically solving such systems will generally perform better if you remove some of the stiffness). Note that the Heavyside function I provide is also useful if you use a package like Mathematica to solve the system of ODE’s; using just a step function will cause Mathematica to choke when attempting to compute the numerical solution. Another instructive thing to do is to edit sir_harmonic.R to print out the fraction of susceptibles in the population when the prevalence is at maxima or minima. Prove to yourself that S/N=gamma/beta at those points. then there always appears to exist at least one time-of-introduction (and often many times-of-introduction) where a dual wave epidemic curve is produced (here I assume R0=beta_0/gamma). This occurs regardless of the value of R0. Even though I have observed this, I haven’t been able yet to mathematically *prove* that this assertion is true. Why is this important? 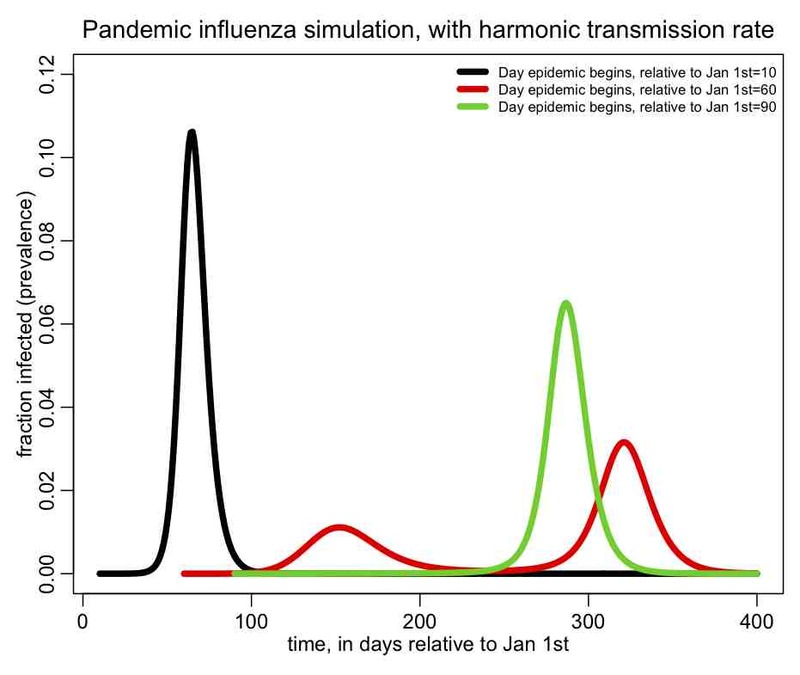 Because the relative seasonal forcing of influenza has been estimated by several studies to be around 20% to 30%, and the reproduction number R0 of the 2009 influenza pandemic was estimated at the beginning to be around 1.5. Look how closely the actual seasonal forcing of influenza matches the “sweet spot” value of epsilon that is calculated from R0! Does this property explain why pandemic influenza is adept at producing in summer epidemic waves? If you are able to prove the assertion above, I’d be very interested to hear about it! This entry was posted in ASU AML610 Fall 2014, ASU AML610 Spring 2013 Lecture Series, Compartmental Models, Epidemic models, Lecture material, NEIU December 2012 Lecture Series, R, SIR model by admin. Bookmark the permalink. Hi Jonathan, Thanks for pointing that out. I’ve uploaded a new version of sir_harmonic.R that should now have that problem fixed.